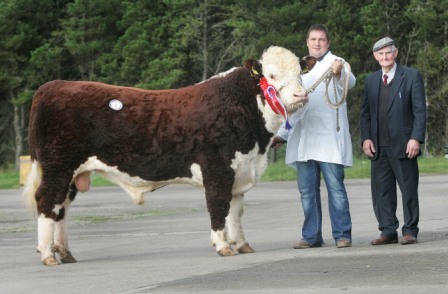 Champion at the Autumn Show and Sale held at Dungannon Farmers Mart was Black Water Leader from S & N Heatrick. This 16 month old bull was sired by Kye Sting 595 but unfortunately failed to meet his reserve. The Reserve Champion was Lisola 1 Crocus 25th from DJ Martin which went on to sell for 2000gns. This daughter of Frenchstone P. 1 Bilbow was also 16 months old. 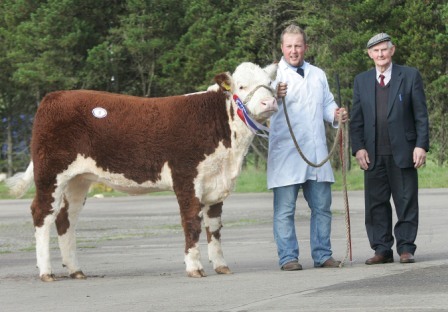 In what was a small selection of Pedigree stock accompanying the sale of Hereford sired commercial cattle the top price went to Umgola 1 Paddy exhibited by Mrs K Greenaway & Mr WG Conn when he sold for 2400gns. He had stood second in the class to the Champion.